The Lifegard Full View Aquarium, shown here as a freshwater planted aquarium. 5-Gallon: 13.8″ wide/long, 10″ high (without light), 13.6″ deep (front to back) at the bottom footprint, 10″ deep at the top. With All-In-One models, the integrated internal filtration compartment is 2.44″ front to back. 7-Gallon: 16.1″ wide/long, 10.6″ high (without light), 14.5″ deep (front to back) at the bottom footprint, 10.6″ deep at the top. With All-In-One models, the integrated internal filtration compartment is 2.44″ front to back. There are several configurations available based on these two core form factors, allowing aquarists a wide range of options depending on their experience levels and intended uses for the tanks. The Lifegard Full View Aquarium, running here as a reef tank. Leading the charge, Lifegard has introduced a complete “all-in-one” platform for the Full View aquariums, which they refer to as “with back filter.” Describing this configuration, Lifegard says, “This modern-designed aquarium comes complete with all the necessary mechanical filtration, carbon filtration, full-spectrum LED lighting, Quiet One 400 Pump, Integrated CO2 / O2 dispensing capability, water level control with waterfall, Bio Media, aquarium pad, and flex water flow required for a healthy ecosystem.” In short, when you purchase the “complete” version of this aquarium, you truly have everything you need, all pre-packaged to work together, which takes all the guesswork out of the equation. 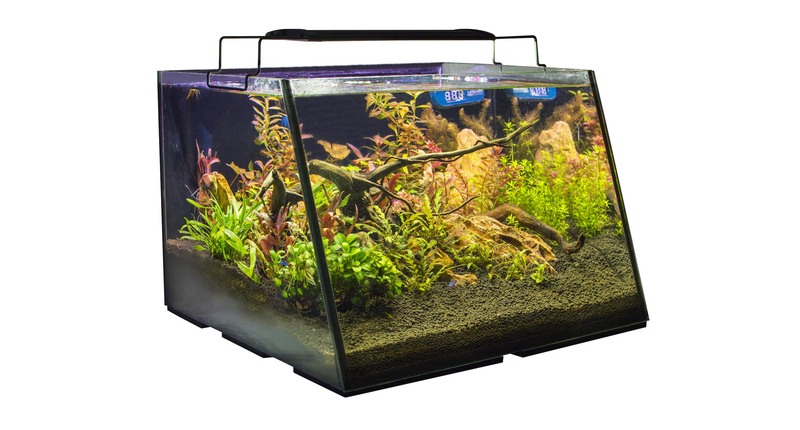 For aquarists who like the built-in filtration design, but would rather choose their own lighting and heating solutions and already have basic maintenance equipment, a scaled-back kit is also available. 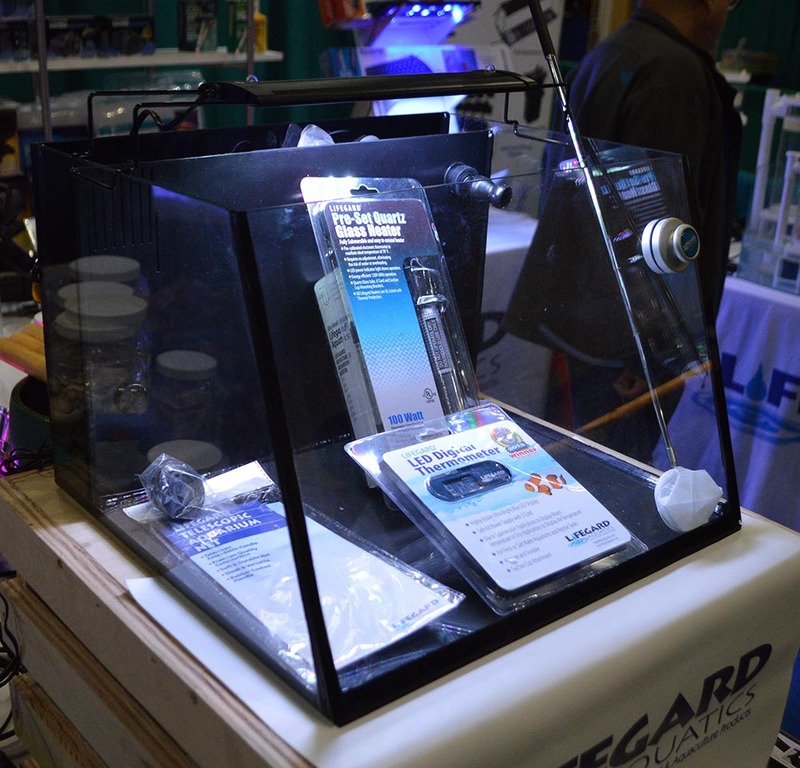 For those who require less on the filtration front, Lifegard also offers their Full View Aquariums as kits without the built-in filtration system, instead featuring the 137 GPH LIFEGARD® Submersible Nano Filter and their LED lighting system. 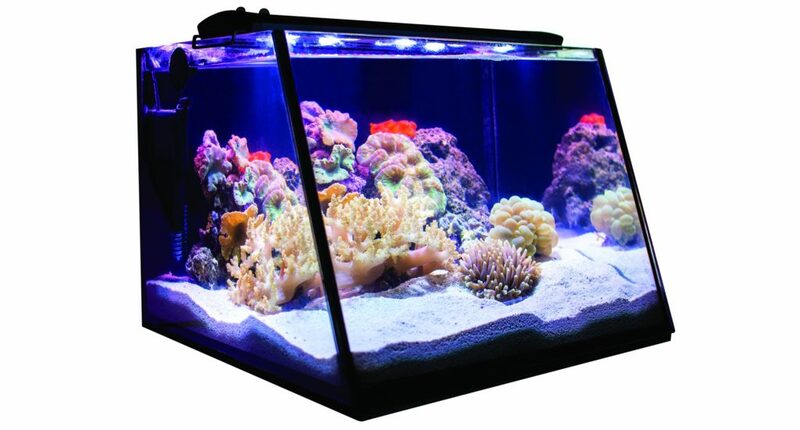 And if you really love the shape and size of the Full View Aquariums, but want to take over total customization of the life-support equipment, Lifegard will even sell you just the glass tank! A quick call into LIFEGARD confirmed that these aquariums can be drilled (they’re not tempered glass), although the customer service rep suggested that “it’s pretty risky, since they’re already assembled, but yes, they can be drilled with the proper equipment.” So, if you wanted to drill one of these unique glass aquariums for an external filtration system, you could. Recently debuted by Lifegard Aquatics, the new Full View Aquarium line was on display at the Aquatic Experience Chicago. Visit the Lifegard website, where more information can be found on the Full View Aquarium product page. To get a look at the interior filtration design, download this full parts list for the Full View Aquariums.